RELIGION 123/JEWISH STUDIES 100. Lecture, plus recitation. This course introduces students to the field of Jewish studies as an academic discipline. Jewish studies is by nature interdisciplinary and can be approached from a variety of viewpoints and discourses. The course will address foundational texts, developments, and ideas in Judaism from the biblical world to contemporary contexts, while exploring major approaches to Jewish studies in the scholarly world today. We will explore key historical, textual and cultural trends in the study of Judaism, along with topics, terms and methods that are central to intellectual discourses within Jewish studies. Questions to be addressed include: How should sacred texts be studied? What makes a text or author Jewish? What are the roles of identity, interpretation, revelation, law, tradition, innovation, inclusion, practice, and belief within Judaism? How do scholars from disciplines such as history, literature, philosophy, biblical and cultural studies respond to questions like these? Throughout the course, major historical and thematic developments in Judaism will be examined alongside relevant developments and approaches within the various academic subfields of Jewish studies. Students in the course will gain a general overview of major subjects in Jewish studies while becoming acquainted with different theories and schools of interpretation that have shaped it as a field. 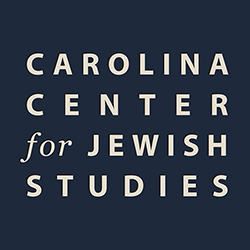 The course functions as both an introduction to the field more broadly and to the Jewish studies program at UNC-Chapel Hill, and it requires no previous background in Jewish studies or religious studies. The course is required for the major concentration in Jewish studies and the minor in Jewish studies. JWST 697 – Capstone Course: Themes and Methodologies in Jewish Studies. The Capstone Course is required for those pursuing the B.A. in Religious Studies with a concentration in Jewish Studies and is also open to non-major students. JWST 697 is a new course that will feature different instructors and a range of topics, but will always delve into a compelling aspect of Jewish Studies. In fall 2012, the Capstone Course was Literature and Jewish Modernity with Professor Jonathan Hess. In fall 2013, the Capstone Course was Jewish Christian Relations Throughout the Ages, taught by Professor Yaakov Ariel. In fall 2014, the course How Jewish is Jewish Humor? was taught by Professor Ruth von Bernuth. 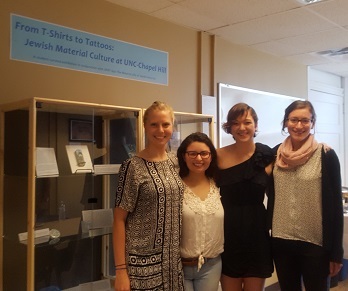 For 2015-2016, the course was offered in spring 2016 with Professor Berlinger, called The Material Life of Jewish America [shown at left with art installation]. In 2016-2017 the course The Holocaust, Memory and Historical Methodology was taught by Karen Auerbach. 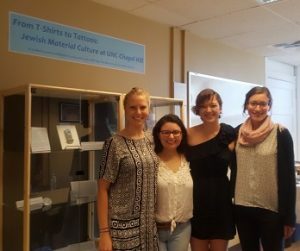 Fall 2017, Joseph Lam led the capstone course with the topic of Jewish Languages.